It’s been a while, but I’m back with a review for y’all! And it’s for one of my new all time favorite reads EVER. Hi y’all! So I’m trying something new (yay!) and I participated in my first ever blog tour- and subsequently my first ever ARC review- for Shannon Parker’s upcoming novel The Girl Who Fell. So without further ado, here it is! YA Fantasy Challenge: Check in Two. I bet y’all thought I forgot. Alright y’all! I just wanted to do a quick check in with everyone! While life is keeping me busy I am reading! I am currently three books in on the YA Fantasy Send Off. Queen of Shadows was incredible. I’m currently on Snow Like Ashes and it started a bit slow but I am really loving it now. I’m aiming to finish SLA and an ARC of Ice Like Fire before I leave on Friday. As always you can find me talking books and fangirling in general over on Twitter, so come say hi! PS: For some reason the follow my blog link doesn’t show up unless you click directly on a post, and on a mobile site it is at the bottom. If you’re viewing on a web browser then the links should be on the side and bottom! So, as you all know I am leaving in THREE WEEKS for Scotland. 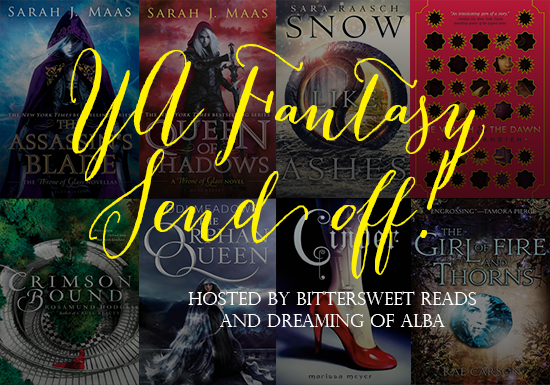 In honor of my upcoming adventure and the end of my very long YA hiatus I am doing a reading challenge with my book BFF, Raquel @ Bittersweet Reads.